A spectacular display of serene beauty awakened the night sky. There were no clouds above, just vast space and billions of brilliant stars. I sat still in the darkness, gazing with wonder at the familiar, yet distant night sky. I connected stars to constellations and pondered the realm of outer space. Clearly, I was entranced by creation, but even more by my Creator. There's beauty in the quiet. Day after day, choices are made. What will I make of the time given to me? Many days I run ragged with too much on my mind and lists. When time is limited, so should my tasks be, but so much more demands my attention. Or does it? A “yes” is said to way too many things, invitations, and whatever else. “Yes” seems to be the easier way of life. Why is it much harder to say “no”? At what point did doing more become more valuable in our day? We live in a day when technologically advanced tools make it possible for us to manage copious amounts of tasks. We accomplish more tasks in one day than generations before us. Do these tools really give us a sense of final accomplishment or leave us more distracted and addicted to accomplishing more? Perhaps doing more has nothing to do with technology. Maybe, doing more looks like relentless working. The kind of working that's motivated by vain striving with no foreseeable end. And what about the quiet? Is there such a thing as quiet or is quiet an elusive pursuit? Making the hard decision to work less, (as God directs you). Because there's beauty in the quiet, when doing less is better than more. Another day my washer hums through cycles because I designated the day for laundry. A few other tasks were added to my list but nothing more. My day would be busy enough taking care of my family. 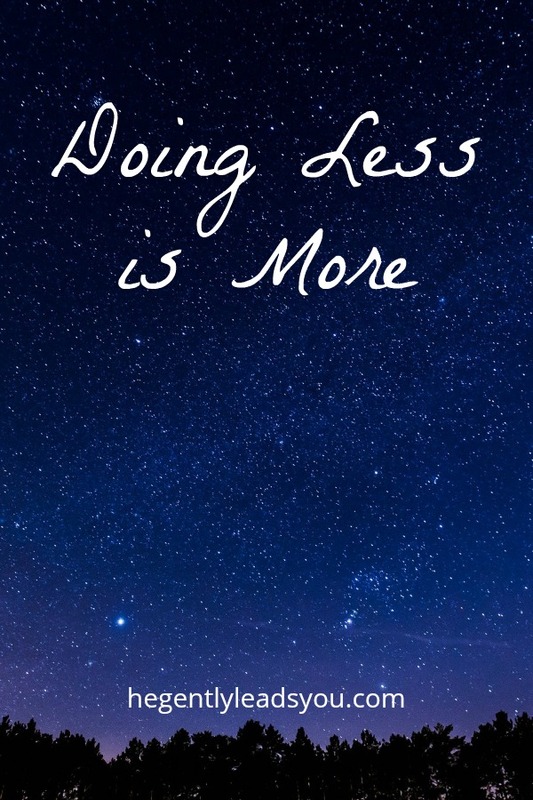 So, I chose to do less, because I decided my less is better than more. Then, I snuggled up close with my two youngest daughters to read a stack of storybooks. Time went by without a chime from my phone or guilt from my list because little by little, I'm beginning to live—beautifully in the quiet. I invite you to learn more truths from the book of Ecclesiastes. Download the free Bible study in the Library of Downloads page.